West Texas crude oil is at a fresh four-month high and has risen above $59. It's up 62-cents today after a choppy day on Friday. OPEC leaders decided to extend the output cut agreement and scrapped the April meeting. Instead they will meet in June and will likely extend cuts until year end then. The delay is an effort to see what the US decides on Iran sanctions. It also offers more time to evaluate developments in Venezuela. 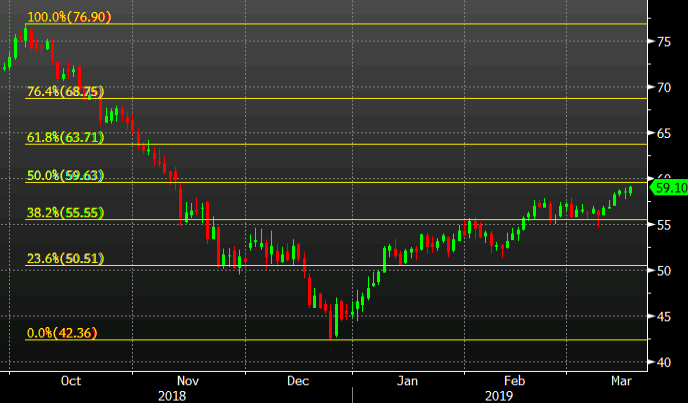 "As long as the levels of inventories are rising and we are far from normal levels, we will satay the course, guiding the market towards balance," said Saudi oil minister Khalid al-Falih. Technically, it's about to get interesting with the 50% retracement of the Q4 plunge at $59.63 followed by resistance at the big figure.